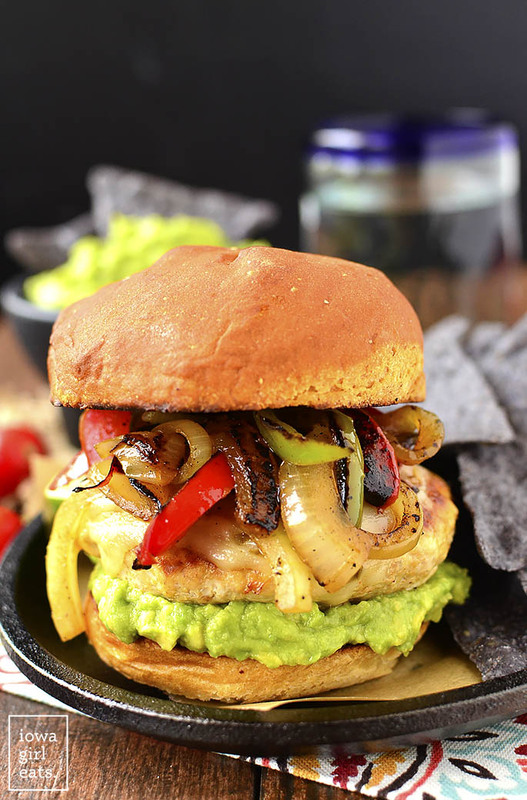 Chicken Fajita Cheeseburgers are a festive and fun gluten-free dinner recipe! Grill outdoors or in a skillet indoors. Hello from the other side of another summer weekend! I hope you had a wonderful past couple of days. ? 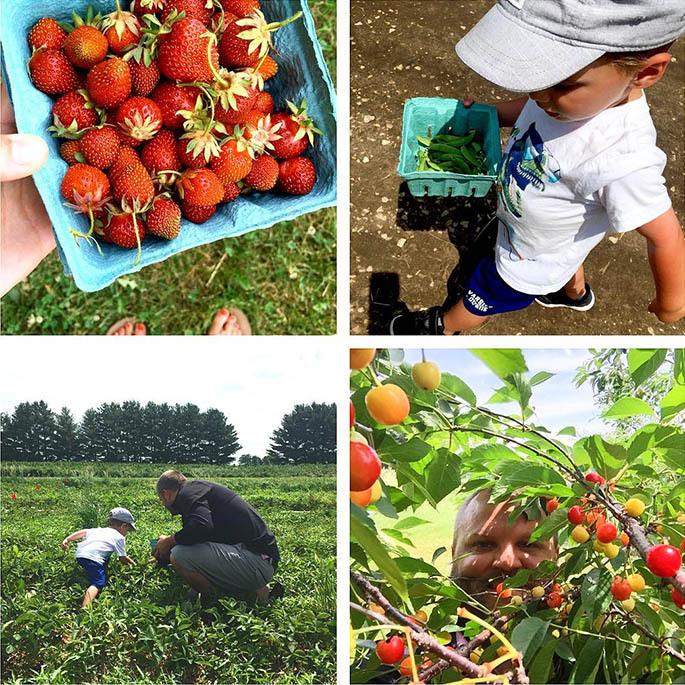 We made some headway on our Summer Bucket List and went produce picking at our favorite little farm – Berry Patch Farms in Nevada, IA (just south of Ames) – on Saturday morning. 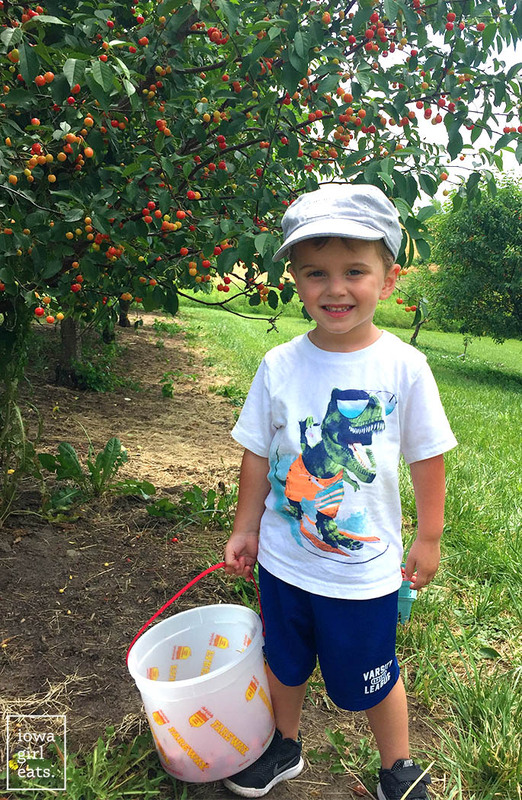 We’ve been apple picking there every fall for years, but this was the first time we’ve made it out for tart cherries, strawberries, and snap peas. Our little cherry picker did so with a strawberry stained mouth – they were sweeter than candy! We walked away with a nice haul of strawberries and tart cherries, which Ben turned into pie on Sunday (?) plus some sugar snap peas to snack on. There is nothing better than freshly picked produce that YOU picked yourself, not to mention getting a chance to show your children that food doesn’t just come from the grocery store. The fact that Lincoln has previously refused to try sugar snap peas that I’ve brought home from the store, yet showed zero hesitation chowing down on the ones he picked from the vine speaks volumes. Can’t wait to come back in the fall for apples! Sunday was a lazy day spent running errands and eating pie (we used my friend Chelsea’s Pie Crust recipe, swapping cold shortening for butter, and using King Arthur gluten-free baking mix instead of all-purpose flour, and it was to die!) and typing up this fine burger recipe that you’re going to want to find room for on your menu plan this week. 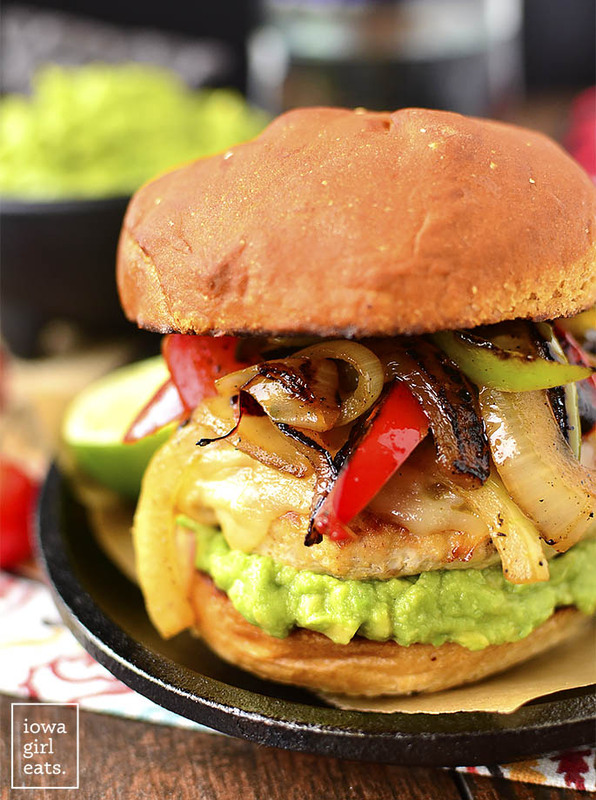 No grill, no problem because Chicken Fajita Cheeseburgers can be cooked indoors or out! Burgers are synonymous with summer, and we eat them quite often around here. They take, like, 5 seconds to whip up (I just season ground beef with worcestershire sauce, seasoned salt and pepper,) and since Lincoln loves ground beef I know he’ll always eat a great dinner when they’re on the menu. I make them so often, though that I decided to switch things up recently and make these juicy chicken burger instead. Ok, another inspiration for this dish came from the fact that I absolutely annihilated a batch of steak fajitas a couple weeks ago. I had a beautiful flank steak that I sizzled up using my standard Chicken Fajita recipe and it was just…bad. For me, fajitas need to be either chicken or shrimp, and the recipe flop had me craving the real thing in a really bad way. 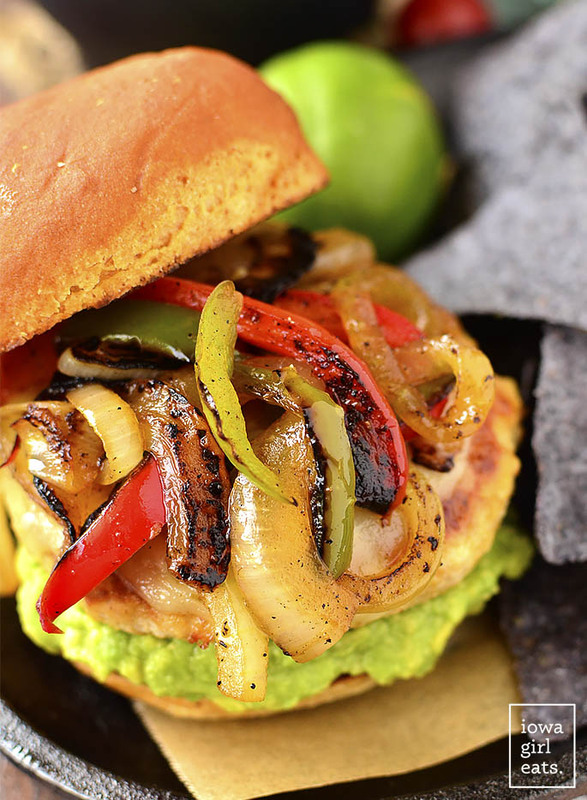 Chicken Fajita Cheeseburgers totally delivered. Simply seasoned ground chicken is sauteed in a skillet indoors, or grilled outdoors, then topped with Pepper Jack Cheese for a little south of the border kick, an unethical amount of easy homemade guacamole, and a mountain of sizzling fajita vegetables. Redemption was mine after taking a big bite of these burgers – they are as delicious as they are gorgeous! 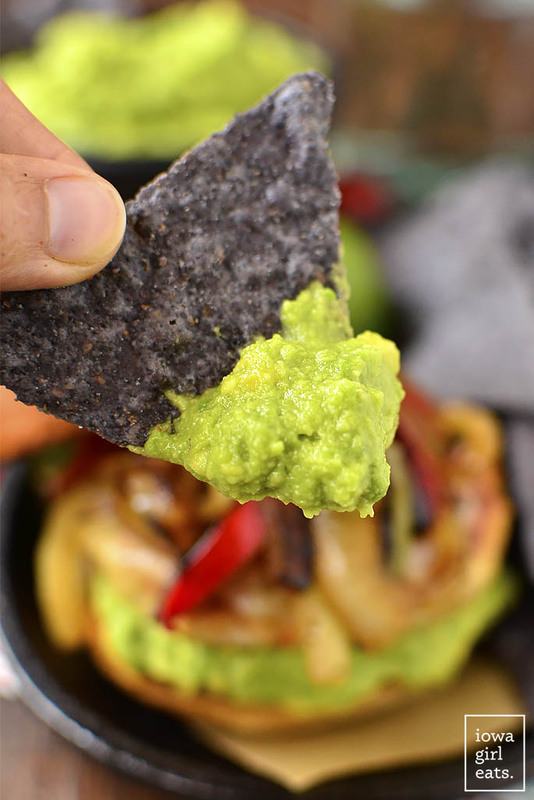 Start by making a batch of homemade guacamole for topping the burgers with. I always order fajitas from our favorite Mexican restaurant with a side of guac instead of corn tortillas – can’t have one without the other! Simply mash 2 large ripe avocados (or 3 small ones) with 1 clove pressed or minced garlic, the juice from 1/2 lime (or more or less to taste,) and a heavy sprinkling of salt until smooth. Pro tip: Cover the guacamole’s surface with a layer of plastic wrap then stash in the fridge. You can do this up to a day ahead of time as the saran wrap directly on the guacamole will prevent it from browning. Woot! Next make the chicken burger patties. You’ll need 1-1/3lbs ground chicken (I used a combination of 1lb ground chicken breasts and 1/3lb ground chicken,) 2 Tablespoons melted butter, 1 teaspoon chili powder, 1/2 teaspoon cumin, the juice of 1/2 lime, pepper, and homemade seasoned salt. Ground chicken burgers have a reputation for being dry so the butter helps keep them juicy, and I love the flavor it adds too (you know what they say about butter making everything better!) Mix everything together until just combined then shape into 4 patties. Time to cook! Place a large skillet over heat that’s just a touch above medium then spray with extra virgin olive oil or nonstick spray. Add the patties then saute for 4 minutes a side, or until cooked through. Place a slice of Pepper Jack Cheese on top of the patties during the last minute then cover with a lid and allow the cheese to melt. If you’d rather fire up the grill and cook these burgers outside, that’s fine too! Grill for the same amount of time over medium/medium-high heat then add the cheese during the last minute. Ok! 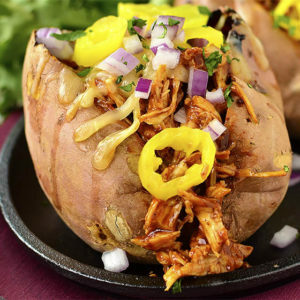 While the chicken burgers are sauting in one skillet, get the fajita vegetables sizzling in another. They cook in the same amount of time which I love. 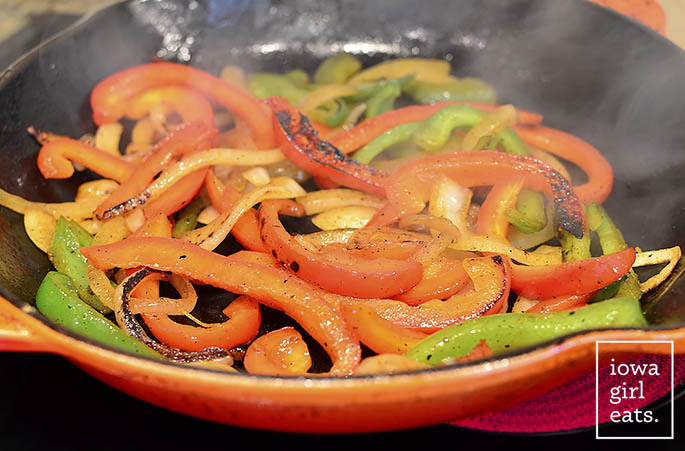 Heat 1 Tablespoon neutral tasting oil like avocado, almond or vegetable in a large skillet over medium-high/high heat then add 1/2 the mixture of 2 sliced bell peppers and 1 sliced sweet onion. Season with seasoned salt and a pinch of cumin then sear until the vegetables are crisp-tender, 3-4 minutes, and then remove to a plate. Sear the remaining vegetables in another Tablespoon oil, seasoning with seasoned salt and cumin. Fajita fabulousness!! FYI this mixture is insane on top of blue corn tortilla chips with guacamole. Just something to think about. Finally, toast gluten-free buns (Canyon Bakehouse has the closest I’ve tasted to the real thing) then top with a patty, guacamole, and tons of fajita vegetables. These burgers are also amazing without a bun, if you please. However you serve them, ENJOY! 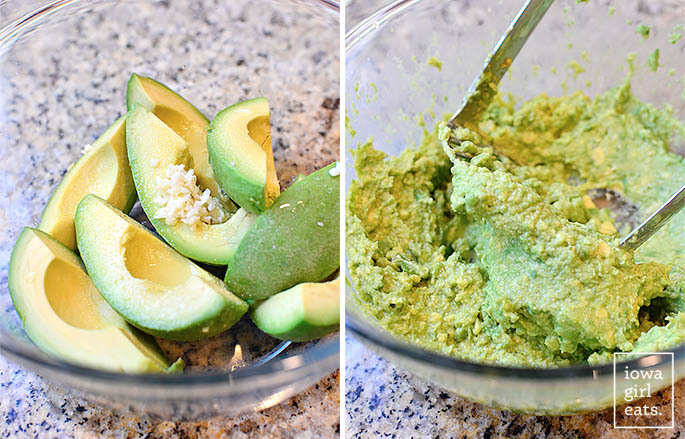 Add ingredients for guacamole in a bowl then mash until smooth. 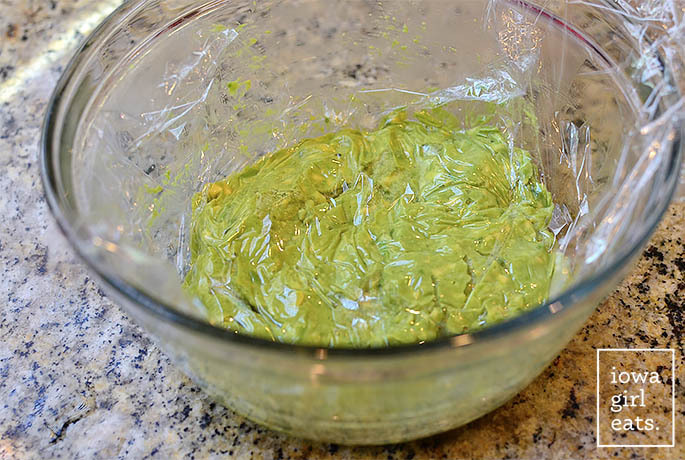 Place a piece of saran wrap directly onto the surface of the guacamole then place in the refrigerator. Add chicken, butter, chili powder, cumin, lime juice, pepper, homemade seasoned salt (or regular salt,) in a large bowl then mix until just combined. Shape into 4 patties. 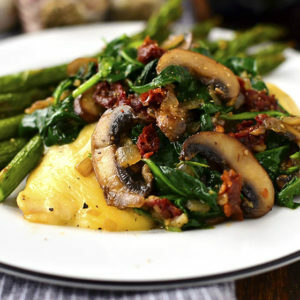 Place a large skillet over heat that's just a touch above medium then spray with extra virgin olive oil or nonstick spray. Add patties then saute for 4 minutes a side, or until cooked through. 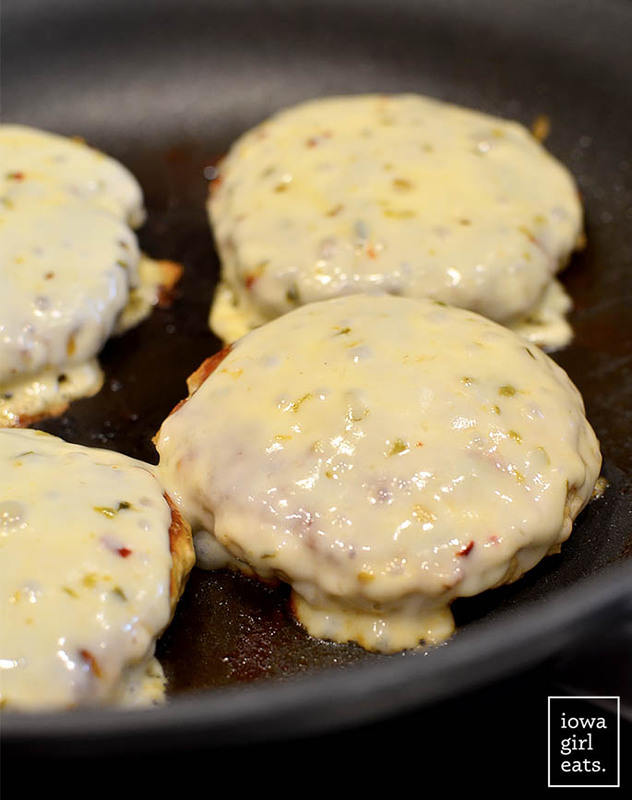 Add cheese slices on top of burgers then place a lid on top of the skillet and allow cheese to melt. Remove cheeseburgers to a plate. Meanwhile heat 1 Tablespoon oil in another large skillet over medium-high/high heat. Add half the vegetables, season with homemade seasoned salt (or regular salt,) and a pinch of cumin then saute until vegetables are crisp tender. Remove to a plate then heat remaining Tablespoon oil in skillet and saute remaining vegetables, seasoning with homemade seasoned salt and cumin. 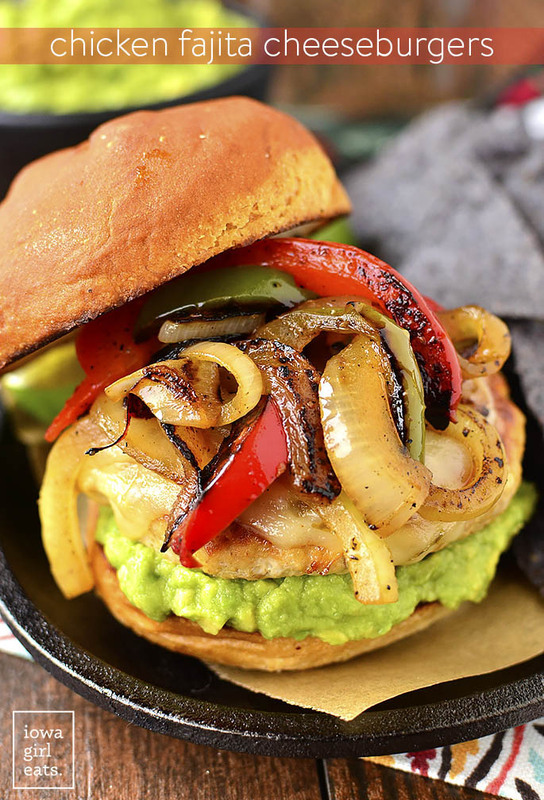 Place cheeseburgers onto buns, top with guacamole and fajita vegetables, then serve. To use an outdoor grill: spray one side of the patties with nonstick spray then grill for 4-5 minutes over medium heat, spraying top sides with nonstick spray before flipping. 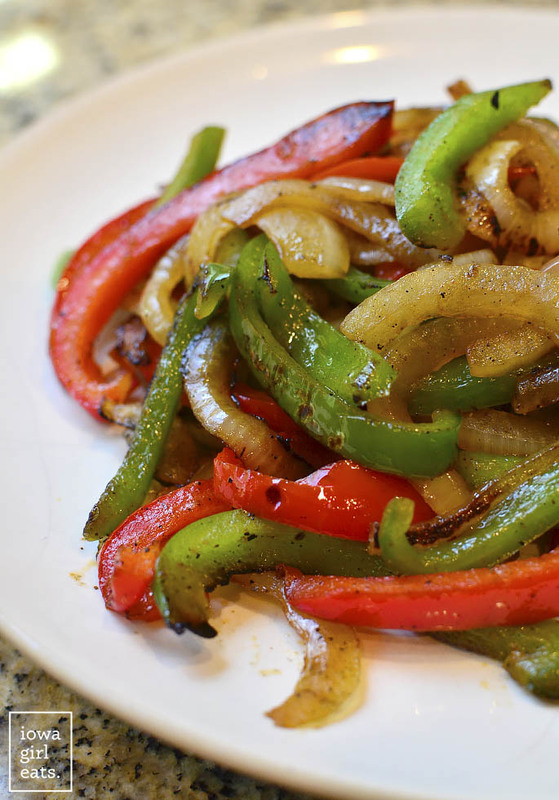 Sear fajita vegetables either in a skillet indoors, or in a grill basket. (And, speaking from experience, maybe make a double batch of guac?) ? Oh my goodness – that WAS you at the Berry Patch on Saturday! I was too shy to come over and see to tell you I read your blog all the time. I should have been courageous! First of all, congratulations on your coming baby boy! I’ll bet you all are excited beyond impossible! Secondly, I would love to know where you get gluten free buns? I have looked and looked. I have recently moved from Oklahoma to Texas so maybe my local HEB could order them for me….also, please share the brand name? Thank you! The very best to your family! I live in Texas and my local HEB has Udi’s brand gluten free buns in the freezer aisle. We toast them and they end up being pretty good! Thank you so much, Jan! :) These are Canyon Bakehouse GF buns which, around here, you can buy at Super Target and both the regular and specialty grocery store. They are usually in the special diet freezer section. I would definitely ask your store to put in an order of the buns plus their bagels and Mountain White bread. I don’t buy any other brand of GF bread products other than Canyon Bakehouse! Oh wow! My husband would go crazy for these! I love your dress! Please share where you found it! Also love the addition of guac on burgers, so delish! Thank you! :) It’s from Banana Republic. Hi! These sound amazing! 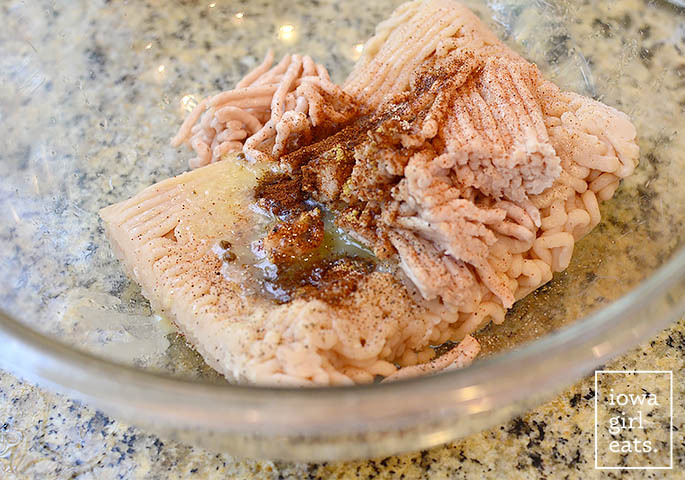 And what a great idea to add a little butter to keep the patties juicy. Also you and Ben look adorable! I really love the oversized white square frames with the photos of Lincoln! Where did you find the frames?! Hi Kristin! This recipe sounds delicious! I’ve never used ground chicken before. What’s the difference between the ground chicken breast and ground chicken? 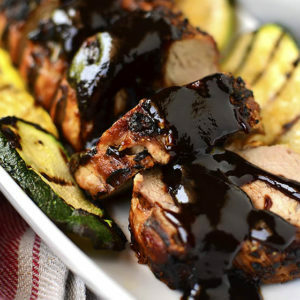 Is the ground chicken dark meat? Do you think it would taste okay with all ground breast meat? Thanks! Good question, Lori! The difference between the two is ground chicken breast is ground boneless, skinless chicken breasts while ground chicken can include dark meat, skin, and fat. We try and watch our consumption of chicken fat because it’s high in cholesterol (both Ben and I try and watch ours,) but cutting ground chicken breast with it gives the dish more flavor and a little fat, which it needs! 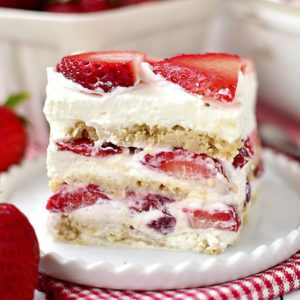 That looks delicious. Also, we got our Wellmark magazine today and great cover picture and story about you in it! Thank you, Jones, such an honor! Iowa Girl, can I just say you never stop impressing me with your new recipes? 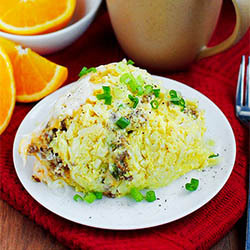 I’ve been reading your blog now for over 7 years and I’m embarrassed Ive only commented a handful of times when many of your recipes have become staple meals in our home. I wish you knew how many of your readers probably do that too. 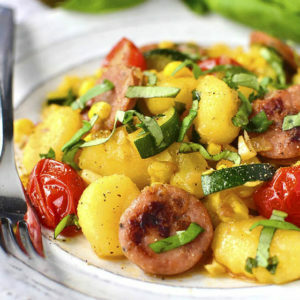 Every time I come to your blog you keep bringing something fresh, tasty and creative – like this! Chicken fajita cheeseburgers? Genius! Thank you for a different, fun type of burger to try! You look beautiful by the way. 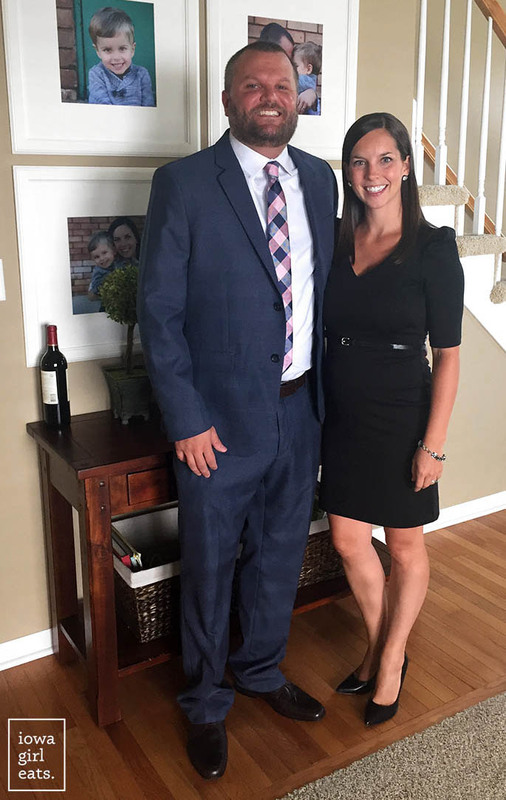 Hope the wedding was fun! Chicken burgers are so summertime for me. I could sit out on the patio every night with a burger like and be perfectly content, no problem. I’ve gotta give this one a try! Same! Hope you enjoy, Karly! We made these yesterday for Father’s Day and they were delicious! My husband grilled them outside. I bumped up to 2 lbs of ground chicken to feed everyone and didn’t use the chicken breast because my store was out of it (#lastminuteshopping). 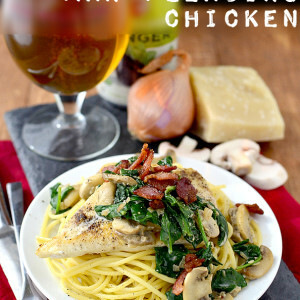 Thanks for another wonderful recipe, I can always count on your site! I want to try the brat burgers next! SO glad to hear, Sara!! You are too kind – I know you’ll love the brat burgers! I made these for my people last week and they LOVED them. Gave them an A plus. Thanks for another winner! So glad everyone loved them, Sally! Thanks for letting me know! So glad to hear, Brandy! Thanks so much for the feedback! I tried these also, and they’re awesome! I’ve tried a few and they have all been great!